It's one giant step for fashion this fall. Jimmy Choo and Moon Boot are teaming up for a collection that, while unusual and unexpected, will no doubt be epic. Jimmy Choos are the sleekest, sexiest gold standard in stilettos, while Moon Boot is an Italian label that crafts winter boots with a spacey vibe. Moon Boot founder Giancarlo Zanatta took his initial inspo from the footwear of the Apollo 11 astronauts when they landed on the moon in 1969, according to WWD. So, no, the brands don't really do the same thing, stylistically speaking. The aesthetics and the purposes are different to say the least; Choos are fancy and Moon Boots are more functional, yet still stylish. That said, I am way stoked that these two opposite ends of the shoe spectrum are joining forces and I can't wait to see where and how they meet in the middle. The possibilities are endless, since Jimmy Choos can certainly add a dose of glam to Moon Boots, and in turn, Moon Boots can perhaps bring a little more utility to Choos? I really don't know and I don't care about the specifics. I just want to see the result of this mashup. Jimmy Choo creative director Sandra Choi told WWD that the brand digs the "futuristic, yet retro-cool Italian design of Moon Boot" and the team is stoked to create a "Jimmy Choo signature look befitting the style." Here's everything we know about this pairing. The line will be limited edition and will boast eight pieces.​ Here is a signature Moon Boot, so you can start thinking about how this combo will go. The collection will land in stores in October, the 10th month of the year, obviously, and right around Christmas shopping season and of course at the onset of colder weather. They will retail at Jimmy Choo boutiques, select department stores, on Jimmy Choo's website and on Moon Boot's website, as well. The shoes will be luxe, of course, and constructed of materials like shearling and fox fur. Jimmy Choo has done collabs before but this one has me most excited. 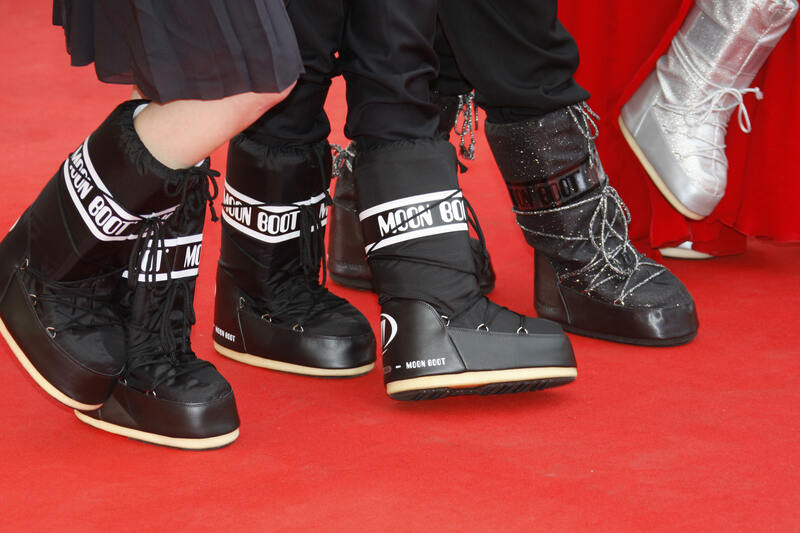 Alright, Jimmy Choo x Moon Boots. Bring it. Let's make winter boots all sorts of hawt.